Learn lacrosse tips, tricks, and insights from one of the best to play the game! 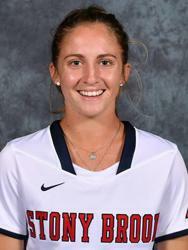 Kylie Ohlmiller (Stony Brook Class of 2018) is a current member of the United States Women's National Team/Team USA (USWNT). the number 1 overall draft pick (2018) for the New York Fight of the Women's Professional Lacrosse League (WPLL). She is sponsored by both New Balance Lacrosse and Brine Lacrosse. High School (7th -12th grade)/Advanced from 10:30 am-12:00 pm (noon). Space is limited so don't miss out on your chance to learn from who ESPNW dubbed the Human Highlight Reel in women's lacrosse.